The Qur’an is the most read book in the world but perhaps the least understood. Although the Qur’an is in this world it does not belong to this world. It is the eternal word of Allah, The Most High. It is unlike any other book - its style and arrangement are unique and so is its method of teaching. It is ironic that many people do not realise this. They approach the Qur’an as they would approach any other book and this often leads to confusion and disappointment. 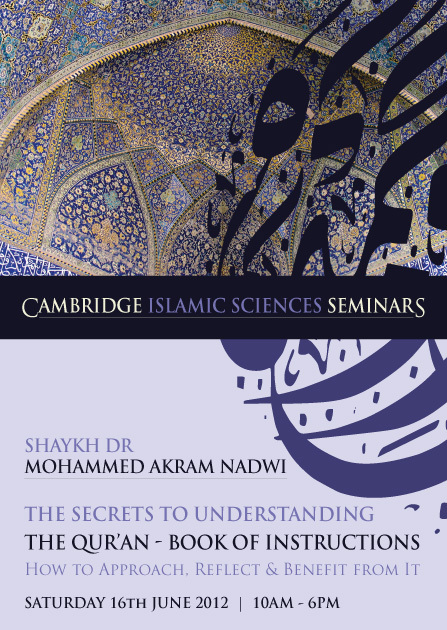 The forthcoming groundbreaking seminar deals with this problem and provides the necessary framework for understanding, reflecting and benefiting from the Qur’an in a way that has not been done in the English language before, by one of the foremost scholars of the western world. Places are limited please register online today. Is Muhammad (PBUH) The Greatest Economist? Islamic Finance - A Myth or A Reality?